Bacteriophages – for the uninitiated – are viruses that are essentially predators of bacteria. Sankar Adhya, Head of the Developmental Genetics Section at the NIH, National Cancer Institute, USA, gave the opening talk at a special session on “100 years of phage discovery” Adhya, who has worked on bacteriophages for almost 50 years began his lecture with a historical overview of what he termed ‘the discoveries and personalities in bacteriophage research’. “It all began with F. Twort, of the Brown Institution, who was trying to culture the smallpox virus on bacterial growth medium to obtain ‘non-pathogenic’ strains of the virus for vaccinations”, he said, “and then, there was d’Herelle, who also claimed to be the discoverer of bacteriophages in a paper in 1917”. Unfortunately, history is a bit murky when it comes to who deserves the credit for discovering bacteriophages. Should it be Hankin, who, in 1896, seems to have described the bactericidal action of Ganges water, or Twort, with his vague descriptions of “a minute bacterium, a tiny amoeba, an ultramicroscopic virus, perhaps an enzyme with the power of growth”, or d’Herelle, who did indeed coin the term bacteriophage? What is very interesting, is that d’Herelle also pioneered ‘phage therapy’ against diseases such as cholera, diarrhoea and even plague in India, France, and what was then USSR, before the advent of penicillin antibiotics. Through Adhya’s talk, a string of famous names from the history of molecular biology emerged—Delbruck and Luria, Hershey, Joshua and Esther Lederberg, Brenner, Jacob and Monod, Arber, Lwoff, even Watson and Crick. Although this history was not strictly chronological, it did give the audience the feeling that phages were the model organisms that provided insights into some of the most important molecular concepts in biology. The confirmative experiment demonstrating that mutations are random and pre-adaptive was performed by Luria and Delbrück in their famous fluctuation test. The readout for this test was bacterial resistance (through mutation) to the T1 phage. The definitive experiments by Hershey and Chase that proved DNA to be the molecular carrier of genetic information also involved bacteriophages. By growing bacteria in media enriched with radio-labelled sulphur (which would be specifically incorporated into proteins) or radio-labelled phosphorous (which would be specifically incorporated into DNA), and then infecting them with T2 phages, Hershey and Chase obtained two unique sets of progeny T2 phages. One set had radio-labelled proteins and the other had radio-labelled DNA. Using these, they were able to show that it was the DNA that entered and infected the bacterial cell to form more phages, hence proving DNA to be the ‘genetic stuff of life’. About 10 years after the Hershey-Chase experiment, the discovery of the triplet nature of codons in the 1960s by Crick, Brenner, Barnett and Watts-Tobin also involved a phage—the T4 bacteriophage. In an autobiographical account, Brenner states that the quartet’s famous discovery came about while they were ‘playing around’ with mutant T4 bacteriophages that were known to have insertion or deletion mutations (arbitrarily named pluses or minuses) in a specific gene. ‘Mixing’ (or recombining) three ‘plus’ mutants or three ‘minus’ mutants could result in normal phages, but mixing 4 or 5 didn’t. This rather nebulous concept of the idea of a ‘triplet code’ using the T4 phage was indisputably confirmed by Nirenberg and Matthaei in a cell-free system in the same year and paved the way towards cracking the genetic code. The concept of recombination, the definition of a gene as a cistron, recombination as a mechanism of integration into genomes, the operon model of gene control—the list of biological breakthroughs involving phages simply goes on. The first fully sequenced DNA genome was also that of a phage—the ɸX174 phage (pronounced phi-X-174). This bacteriophage was in some ways, the model organism to usher in the age of synthetic biology since Arthur Kronberg first used it to prove that ‘artificially’ synthesised DNA by purified enzymes and nucleotides could produce all the features of a natural virus. The ɸX174 phage genome was also the first genome to be completely assembled in vitro from synthesised oligonucleotides. It feels like bacteriophages have injected their DNA (literally) into every aspect of molecular biology and biotechnology known today. Almost every major discovery or leap of understanding in this field involved phages in some way. The observation by Luria and Human that bacteriophages growing within infected bacteria could be modified such that the growth of subsequent phage progeny in related bacteria were ‘restricted’ was a hallmark discovery. It opened the doors of biology to the world of host-controlled modification, which eventually led to the breakthrough finding of restriction enzymes that could be used for controlled manipulation of DNA. Therefore, the very foundations of genetic engineering essentially rests on the biology of bacteriophage infections. After this mildly unordered, yet lively history, the talk turned to current research on bacteriophages. The work discussed at the conference during this session could be broadly classified into two subjects—one, how phages make life-cycle decisions when they first enter their hosts; and the second, the workings of a mechanism that force bacterial hosts to maintain integrated phage genomes. 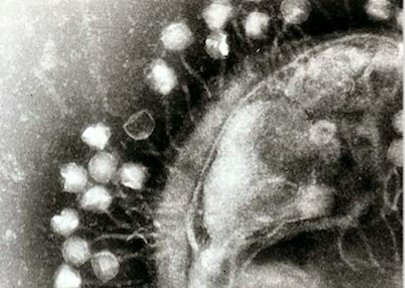 When a phage first enters a bacterial cell, it is faced with an important decision: move into the ‘lytic mode’ with massive reproduction and kill the host bacterium, or go into stealth mode with ‘lysogeny’, where it quietly inserts its phage DNA into the host’s genome and lies dormant? Although one may think that this is a relatively simple question to answer (based on whether resources in the form of bacterial hosts are abundant or not), the decision is obviously more complex, and can be addressed at several levels. Sandeep Krishna’s group from NCBS explore this question of lytic-lysogenic decision making from the perspective of a predator-prey system, while Adhya’s team address this topic at a more molecular level by examining the DNA-protein interactions during this process. Once a phage has made the decision to opt for lysogeny, and the phage integration into the bacterial genome has occurred, some of these intracellular parasites have a devious mechanism (also used by other so-called ‘genomic parasites’) that kill bacterial cells which accidentally lose the phage/parasitic DNA integrated into the bacteria’s genome. This process is driven by a mechanism dubbed the ‘Toxin-Antitoxin’ (TA) system, and is mediated by two genes—one that codes for a stable toxin, and the other, that codes for an unstable antitoxin. The system is also called an addiction module, as once a bacterium gains such a module, it and its subsequent progeny cannot survive without the module. Bacteria that lose their phage-genome insertions containing such modules die because the stable toxin begins its assassination as the relatively unstable antitoxin levels within the bacterium drop. Without the phage genome, the DNA code to create the antitoxin is lost, and these bacteria are selectively culled from the general population. The TA modules have been used in biotechnical and biomedical applications as a method of maintaining plasmids within bacterial hosts without the need for antibiotic pressure for selective maintenance. All-in-all, the ‘100 years of bacteriophage research’ session left the impression that even a century spent in probing the inner workings of bacteriophages has not been enough to answer all the questions posed by the abilities of these tiny, ultramicroscopic pieces of life. A hundred years of research on bacteriophages is certainly not going to pass without a celebration honouring the life form and its central role in progressing biology to what it is today. The year of the phage website is a must-visit and has some lovely artwork outlining a timeline on phage research. Articles in the journals Nature and Bioessays and the e-magazine The Wire, make for pleasant reading and serve to remind us that important, if not always good, things can come in minuscule protein packages.